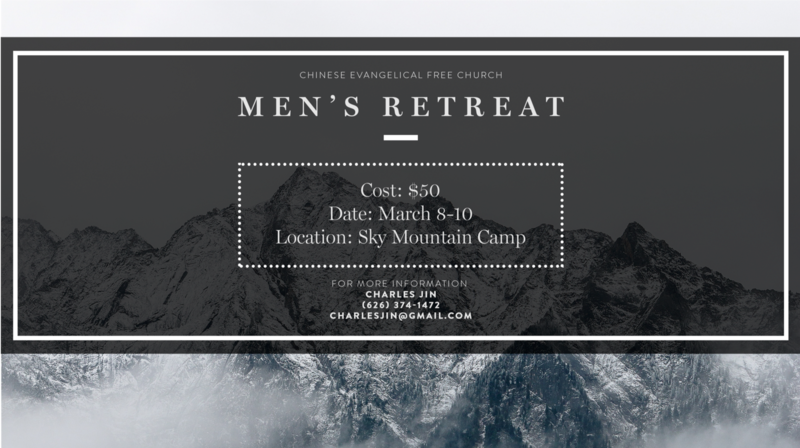 Please register for the Men's Retreat by filling the form below. Location: Sky Mountain Camp at 3780 State Highway 38, Angelus Oaks, CA 92305. Check-in / Check-out: Check in time is Friday 3/8 at 7:30pm. Check out time is Sunday 3/10 at 8:45am. Roommate requests: Beds will be on a first come first serve basis. Please contact Charles Jin (charlesjin@gmail.com) for any request on special accommodations. USD Payments are processed through PayPal. You may pay using an existing PayPal account, or any major credit card / debit card.